I visited Goa last week. Goa remains one of my favourite vacation places. Maybe because I’ve gone there so many times and familiarity, for me, breeds comfort, when it comes to vacation spots. This Feb I was there, we stayed in South Goa. This time we stayed in the North. Here is the list of things I did. The rooms were clean, has a swimming pool, the service is good. Has a pool table (not the best of condition), 150 per hour. Our group had Breakfast and Dinner as complementary. It is close to Baga beach (less than 500 meters). If you are a person who likes to walk-and-explorer a lot, then you can walk to Calangute beach from Baga beach. DAY One: Friend and I got a bike for rent – 300 per day. He wanted to see Chapora fort (location), So we drove to Chapora fort (Dil chahta hai song (or a clip of it) was shot there). It’s a pretty steep climb, but the view from the fort is spectacular. The fort in itself has nothing left of it. One can see the remnants of what it used to be. The fort shot from the center of the fort. We spent close to 45 minutes in the fort and took in the wonderful view. The Sun got to us. It was very hot during the day and mildly cold during the nights. We climbed down and were done with this by 12:30. But we were starving already with all the walking and climbing. TIP: Keep yourself hydrated. Take a bottle of water along with you and a Cap to protect your head from the sun. The place we chose to eat would be the biggest disappointment of the trip. 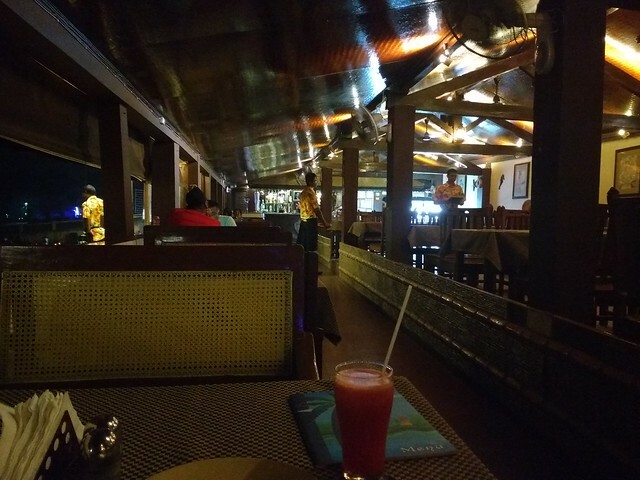 I have had a wonderful dinner (one of the best fruit bowls) at a restaurant with the same name in HAMPI. 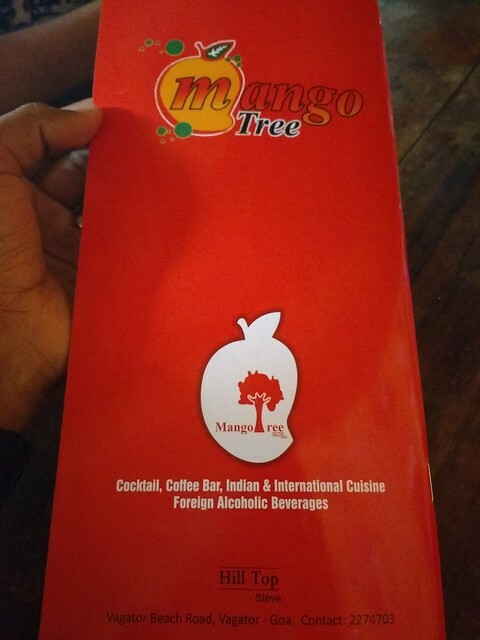 So when we crossed this restaurant in Goa, I thought perhaps this was part of the same chain. Expectantly my friend and I ordered for some dish and were absolutely disappointed. The service bad and the food worse. Fruit custard was hot and Fruit bowl with curd was sour. After the disappointing lunch, we rode back to the resort and took a nap for a couple of hours. Evening came, did my usual when I travel, go for a walk. A long walk it turned out, by the end of the day I had walked 16,000 steps. 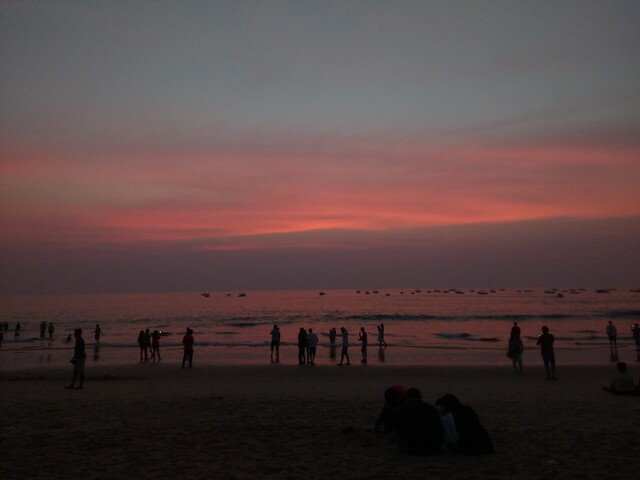 I walked to Baga beach which is closer to the resort and then to the Calangute beach from Baga along the coast. As always it was really good to see everyone in a joyous vacation mode. Here are some of the pics from the beaches. Try the King fish fry or King fish curry with rice. The service is really good and staff is helpful in suggesting the best dish for you. That was pretty much what I did on the first day of the trip. Also keep in mind, that I have gone to Goa 6 times before this. So I was taking it really easy this time and didn’t cram in too many places to visit. Some of my other friends did water sports at Anjuna/Calangute/Baga (any of those beaches). They charge around Rs.2000 for a package of 5 sports. You can negotiate. Next post for day 2 adventures.